Details at the end of this post on how to enter to win a copy of Etched in Bone. We also have a link to order it from Amazon, and from an indie bookstore where a portion goes to help support KRL. For me, right now, Anne Bishop is that writer and her The Others series does it for me. Etched in Bone is the fifth book in the series. In this alternate world, humans are tolerated because of the things they can invent and make, but the true power belongs to massive, ancient creatures called The Others and their lesser forms of elementals, vampires, and shifters. The Humans First, Humans Last movement has been brutally squashed, and Lakeside is one of the few cities in decent shape. Its survival is partly because of the working relationship developed between the local police and the shifters of the Lakeside Courtyard, an enclave The Others are watching. Their observations might decide the fate of humanity. Simon Wolfgard (a shifter-leader in the Courtyard) and Meg Corwyn (a blood prophet who sees the future in a deck of picture cards or ecstatic visions when her skin is cut) are the focus of the observation. Meg’s prognostications are filled with question marks, lately, confused by an opportunistic refugee (brother to a police detective), who manipulates others into situations that put the Courtyard’s existence into jeopardy. Bishop juggles her cast with skill, offering glimpses of the societies of wolves, crows, coyotes, owls, bears, and vampires that emphasize their Otherness, yet shows commonality to the humans around them. The changes the Courtyard put into action are altering the planetary dynamic, showing ways that coexistence can work. This set of books is best savored in its entirety, from Meg’s arrival (Written in Red) to the synthesis of Etched in Bone. Watch the growing feelings of Simon and Meg, their worries about how the other views them as predator or prey. Enjoy how the Courtyard expands to accept and protect the police who try to work with the non-humans. Have fun! To enter to win a copy of Etched in Bone, simply email KRL at krlcontests@gmail[dot]com by replacing the [dot] with a period, and with the subject line “bone,” or comment on this article. A winner will be chosen May 27, 2017. U.S. residents only. If entering via email please include your mailing address, and if via comment please include your email address. Wow sounds intriguing, I’m looking forward to reading it. 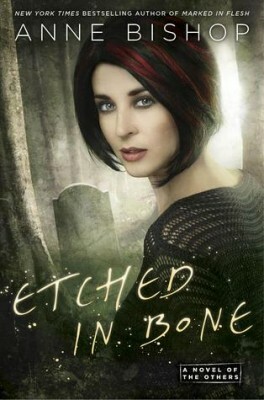 Have been following this series and would love to win a copy of ETCHED IN BONE. Thanks so much! I started this series last year when I had the chance to meet Anne. I love this series (as well as all her other books!!) I still need to read this one yet! Thanks for the chance to win it! This is a great series!! Love it!! Anne has been one of my favorites for a very long time. First, the Black Jewels series, Tir Alainn, Ephemera, and now The Others. When you can open a book and read it again and again and find something new, you know you’ve found a winner. I’ve been waiting for this one for a while. Yes, I’d love to win a copy. I’ve been known to wear books out, especially Anne’s. You nailed it with this review! This is a fantastic series (has Anne ever done a bad one? No.) She really gets you into her characters. Good review. I had this on pre-order and read it awhile back, along with the full series (again, for probably the fifth or sixth time). Etched is on par with books 2 and 3 (Written is still the best, with 2 and 3 not far behind IMO), and was a joy to read. This is the series and author that got me into the genre. I couldn’t give Anne or this series any higher marks, or higher praise. I’ve always loved this author! Great interview and review. This is a new author to me and after reading the post, I’m definitely adding to my TBR list. Would love to read “Etched in Bone”. I’ve heard great things about this series. Thanks for the chance!